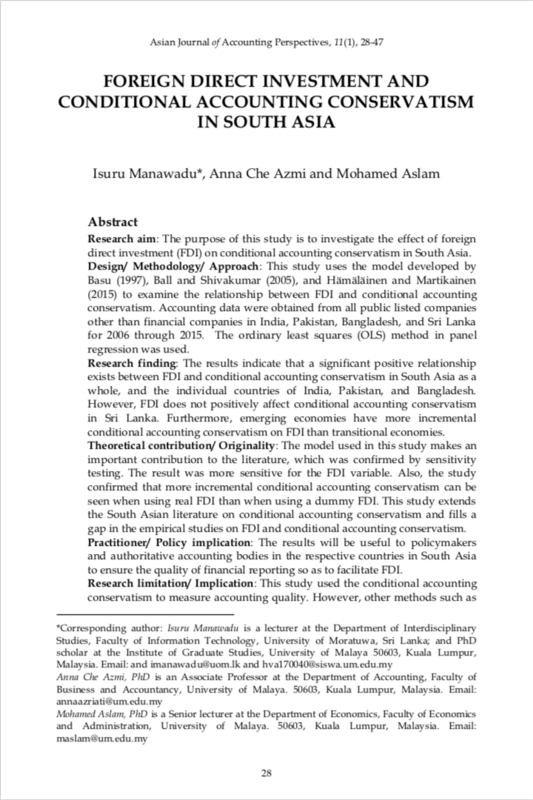 Research aim: The purpose of this study is to investigate the effect of foreign direct investment (FDI) on conditional accounting conservatism in South Asia. Design/ Methodology/ Approach: This study uses the model developed by Basu (1997), Ball and Shivakumar (2005), and Hämäläinen and Martikainen (2015) to examine the relationship between FDI and conditional accounting conservatism. Accounting data were obtained from all public listed companies other than financial companies in India, Pakistan, Bangladesh, and Sri Lanka for 2006 through 2015. The ordinary least squares (OLS) method in panel regression was used. Research finding: The results indicate that a significant positive relationship exists between FDI and conditional accounting conservatism in South Asia as a whole, and the individual countries of India, Pakistan, and Bangladesh. However, FDI does not positively affect conditional accounting conservatism in Sri Lanka. Furthermore, emerging economies have more incremental conditional accounting conservatism on FDI than transitional economies. Theoretical contribution/ Originality: The model used in this study makes an important contribution to the literature, which was confirmed by sensitivity testing. The result was more sensitive for the FDI variable. Also, the study confirmed that more incremental conditional accounting conservatism can be seen when using real FDI than when using a dummy FDI. This study extends the South Asian literature on conditional accounting conservatism and fills a gap in the empirical studies on FDI and conditional accounting conservatism. Practitioner/ Policy implication: The results will be useful to policymakers and authoritative accounting bodies in the respective countries in South Asia to ensure the quality of financial reporting so as to facilitate FDI. Research limitation/ Implication: This study used the conditional accounting conservatism to measure accounting quality. However, other methods such as earnings management, value relevance etc. for measuring accounting quality could be used with FDI in future researches. MANAWADU, Isuru; CHE AZMI, Anna; ASLAM, Mohamed. Foreign Direct Investment and Conditional Accounting Conservatism in South Asia. Asian Journal of Accounting Perspectives, [S.l. ], v. 11, n. 1, p. 28-47, aug. 2018. ISSN 0128-0384. Available at: <https://ajap.um.edu.my/article/view/13414>. Date accessed: 20 apr. 2019.